I play at a very large woodland field, the engagement distances are always maximum range. A lot comes down to, who's gun can shoot the further (accurately) more so then anything else. I have already sold the GHK G5 I had just purchased. 30 rounds and mediocre range was too frustrating for me. I have about £300 to play with, i want an AEG that will be competitive at long range distances. 50-60m.... whilst staying below 350fps. Would it be better to buy a CYMA AK74 (the full steel one's + 495mm inner barrel) and spend money on a PDI barrel and hopup ect.... or should I buy a high end gun? What do other people use at your field? What weight of bb's are you using? I'd start with 0.25s and work your way up as some guns just won't lift heavier BBs. Heavier bbs is definately the way to go. I use .25 or .28. From what ive seen those cymas have great external (and pretty good internal) quality for around £100 from taiwan gun and with a few things, can be a beast of a gun. 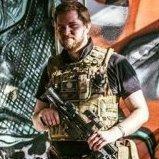 As for what others use sp00n, if josh is referring to billericay it is mainly aeg users, rarely is there someone using a gbbr. If you were there last weekend josh i must've seen you, only one person with a g5. PTS RM4 ERG, once the spring has bedded in it'll run 0.2g BBs at 350 fps with the hop dialled in for 0.3g BBs. 0.25's are pretty much standard for most people. Heavier ammo starts costing significantly more and lighter ammo just doesn't have the range. For good range, the hopup is the main factor. Cyma AK's have a reputation for good hop units, so if you are considering a Cyma AK, just leave the gun as it is. welp.... I just ordered a Cyma .48 ak74. Im going to install a nice barrel and hop-up hopefully it will be nice. The range on the G&G m14's is absoulutely absurd lol. If the Cyma doesn't work out get one of those. the ak74 has the same barrel length as the m14. I dont know much about the ballistics but i guess a longer barrel will be better then a shorter one. My G33 and G5 have rather short barrel lengths. ak74 495mm vs m14's 530mm. probably no where a enough to make a difference but it's still longer lol. It's the G&G's hop that makes it so magical I think. I just remember be gobsmacked by the range when I had mine. Yup, I can attest to this as well. I had the Veteran wood version, it was kicking about 390fps out of the box. I fitted a Madbull 6.03 and ran .30s and I'm not joking when I say I don't think I missed all day. It's a shame I had it before starting the channel, would've made some epic videos. I only had a red dot on it, but if someone was unfortunate enough to end up with that reticle over them, they were gone with a single pull of the trigger. It was just moronic how far and how accurately it could shoot. I would have suggested a cyma M14. M14 are the most accurate aegs due to their excellent hopup design. AK is also a good choice. As said, go for heavy and precise BBs. I use 0.28 even in my pistol - well, because that's what I have in the speedloader for the G3. Cyma barrels are not bad, but a good quality precision barrel does help a bit. I would say buy something you actually like the look of and get to work on making the internals work. Its what I did with my Tar 21, not a single original piece in the airseal system and the hop unit issue has been eliminated with R hopping. A decent gun to start (Krytac are getting famous for their internals) might be an idea but honestly the big range improvements come from finding and fixing the issues in the gun itself and recognising which part isn't performing and how to modify it to make it perform better (or replace it if its badly made). Look into flat hop and r hop if you're serious about range. Flat hop is easier to do but you'll have to change the bucking more often. Just wondering, with a flat hop how often do you need to change the bucking or how do you know when it needs changing? is it an obvious performance drop? When it Splits basically it can be whenever sometimes 3-5 games sometimes more but generally it happens quite a lot with flat hop being the only draw back with it. Having the correct nub is also important.